Since the very first “Programming 16-bit micro controllers in C” (aka the Flying PIC24) book started shipping in the US, I began receiving from my readers requests for a follow up title that would include new and more advanced peripherals such as USB, and would help introduce complex libraries such as those contained in the Microchip Library of Applications. At first I got busy with the PIC32 book, and soon it was time already for a second edition of the PIC24 book. But all along I had been collecting material and ideas and started creating projects using the Mikroelektronika Mikromedia boards. In the book you will learn how to interface to color graphics displays (TFT), read touch screen inputs to design compelling graphical user interfaces for your embedded control applications. You will use sound to provide quality audible feedback. You will learn how to store and retrieve data (fonts, audio, images…) from serial Flash devices and microSD cards. And of course, you will expand your connectivity options to include Full Speed USB and to communicate with personal computers and other devices. 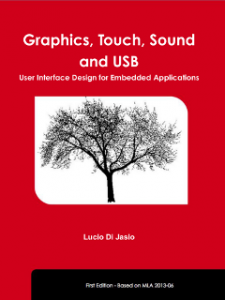 By learning how to leverage two USB classes in particular, HID and CDC, you will avoid most of the USB unnecessary complexity and get straight to address the two most common use cases in embedded control. As usual, this is a hands on learning experience! 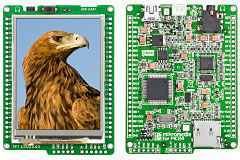 There are eight chapters of gradually increasing complexity where you will develop a number of projects to explore the multimedia capabilities of the Mikromedia board, using 16-bit (or 32-bit if you prefer) micro controllers. Ordering the book directly from Lulu.com (this is a print on demand service using a world wide network of printing facilities to ensure quick delivery in all continents) you will get an automatic 20% discount off the regular price of USD49.50 (39.50). For those of you that prefer Amazon or Barnes and Noble, please be patient, it will take a few more weeks until the full distribution network is enabled and primed. Eventually it took me almost 5 years to put together the material for this book, but I truly hope you will find it worth your time (and money)! This entry was posted in PIC32 and tagged Books, Mikromedia, PIC24, PIC32, Python. Bookmark the permalink.